It is October again – a dangerous as well as a beautifully melancholy time for me. Dangerous, because bad things tend to happen in my life during the Fall and beautiful because, to compensate, fate provides me with wonderful experiences during the same season. The leaves have turned in the Laurentian hills north of Montreal. They look like a mixture of giant red and yellow pillows marching toward infinity under a strikingly blue sky. In the brilliant sunshine, the waters of the innumerable lakes in the region sparkle like a billion diamonds. It is five-thirty in the morning one early October day in 1974 and my eleven year old son and I are already on the beach. He helps me turn the canoe resting on the sand and we silently slide it into the water. He lies down in the prow to provide ballast and I push off. It is chilly, but we are warmly dressed and wearing boots. We drift toward the centre of the lake where the gentle breeze catches the craft and drives it toward the flock of geese that had landed at the western end of our lake the night before. The canoe drifts silently into the gaggle of resting birds. We freeze, hardly daring to breathe. The leading bird honks and his call is picked up by the others. Suddenly, the geese take off and, wings whooshing, fly over us so low that we feel we could touch them if we stuck up our hand as they fly by. I will never forget that sound, surely not as long as I live. I search the heavens every year come October when the geese start honking in the autumn sky and my ageing heart fills with yearning for the whooshing sound their wings make when they take off to leave us for the south. Thank you Bob, for sharring this quintessential Laurentian experience . You have painted a picture that will stay Imbedded on my mental memory disc. Your heart is ageing beautifully O one who once said that the universe is expanding as it should. Beautiful Roberto. 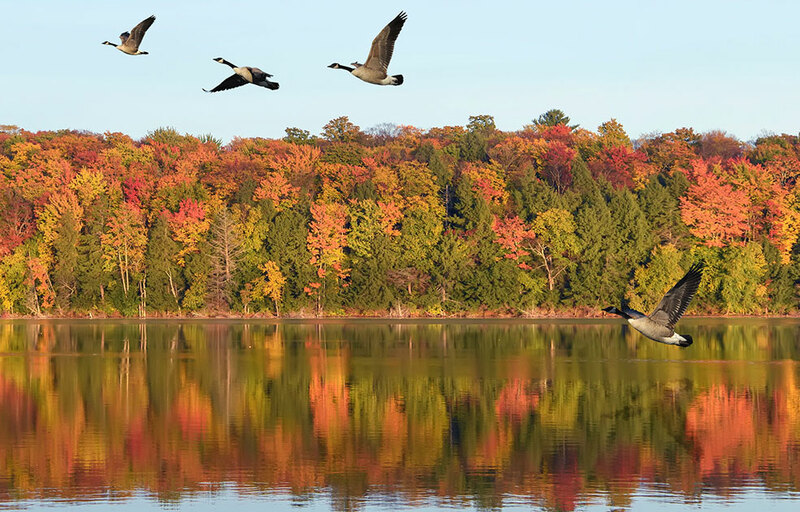 The sound of the geese is one of the most “Canadian” sounds i know.